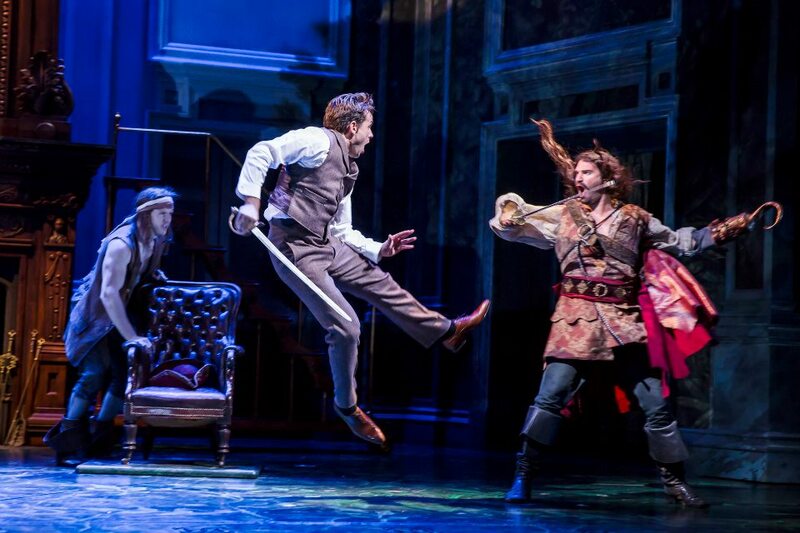 Finding Neverland, is an exquisite piece of theatre. Hollywood mogul Harvey Weinstein has taken the movie that he produced some 8 years ago, hired some accomplished American talent to give the tale a musical theatre treatment and then ingeniously selected Leicester’s stunning Curve Theatre to premiere the work, before it hopefully transfers to the West End and ultimately Broadway. The semi-biographical story opens with author J M Barrie’s latest play being trashed by the critics and how rebounding from that rejection, he finds inspiration from the 4 boys in the Llewellyn-Davies family whom he befriends in Kensington Gardens, to then ultimately go on and write Peter Pan. Married to wife Mary, in what is revealed to be a well-intentioned but nevertheless loveless union, Barrie is irresistibly drawn to the boys’ widowed mother Sylvia. The relationship between these two, whilst platonic throughout, is the fulcrum of the show’s story, charting moments of both joy and tragedy that the writer shares with the young family as the couple’s love for each other develops. Writing Peter Pan, he transforms his sternest real-life theatre critic into the fictional Captain Hook, with one of the production’s most interesting musical numbers, The Pirate Inside, cleverly suggesting that the buccaneer James Hook is really the darker alter ego of James Barrie. The cast, to a person, excel. The performances, including that of a delightful St Bernard dog are all flawlessly perfect. Julian Ovenden plays the writer, who like his famous literary creation, struggles to grow up, displaying a youthful and infectious sense of fun and irresponsibility. Ovenden captures the beautifully voiced essence of Barrie’s character within his performance, every inch more boy than man and yet possessing the personality that Sylvia is drawn too. Rosalie Craig as Sylvia similarly shines. Whilst her elegant figure fails to convince that she has borne 4 sons , her poise and presence are captivating. 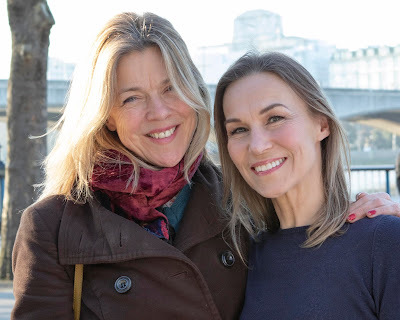 Vocally enchanting, her duet with Clare Foster (Mary), James Never Mentioned, in which each woman’s self-doubts and mutual envies are painfully played out, is a haunting study on a failing marriage and a nascent love affair. Oliver Boot as the critic/Hook character is a convincing villain who both in Peter Pan and as a London critic, torments Barrie. He is every inch the swashbuckling cad and Boot’s energetic delivery is a treat to watch ( and boo!). Liz Robertson, as Sylvia’s disapproving mother also delivers a sterling supporting role, combining compassionate loving mother and grandmother, with being a fearsome protector of her brood. The four talented young boys were led, on press night, by Harry Polden. Already an accomplished child actor Polden held the stage well, displaying his admiration for Barrie, along with his disdain and at times, contempt for the writer, convincingly. Without doubt, this show is a beautiful piece of theatre, but it requires sharpening. Billed as “The New Musical Comedy”, the laughter points were infrequent and often weak. When Barrie’s cricketing contemporaries sing after a lost game, Crushed Again, the number resembles a clichéd attempt to portray a self-deprecating view of stiff upper lip British sportsmanship and whilst that may well be how we are viewed by our American cousins, such stereotyping should have ended with Mary Poppins (the film). Weinstein has spent a fortune on Finding Neverland and it shows in set design, casting and a beautifully rehearsed full orchestra, ably led by David Charles Abell. The producer has also sensibly avoided gimmickry, allowing a wonderfully strong story to tell itself. But the show needs more flying. There is a passing nod to flight in the prologue and again in the closing scene, but that is all. In much the same way as stage blood can make an audience wince at a moment of violence, so on-stage flight can provide moments of sheer breathtaking emotion. At one point in the show, a kite is flown above the heads of the Stalls, almost reaching the Circle. A sweet effect yes, but if that had instead been a Tinkerbell or Pan, sparingly deployed and truly flying within the theatre, the effect would have been profound and with Weinstein’s eye for telling a good story, probably tear-inducing. In a similar vein, the performance of Peter Pan that is put on in the home of the dying Sylvia, is performed upstage, with the spectating family sat front, backs to the audience, impeding the view of the action and distancing the audience from the production. With some minor tweaking this staging should be re-arranged as it currently detracts from the real beauty that the cast create. This enchanting show deserves a successful run and its evolution on to a major London stage should be eagerly anticipated. Harvey Weinstein needs to invest just a little bit more, to make the funny parts of his show funnier and to deepen the poignancy of some magical moments in a wonderful story.